On raiding it, they found 13 playing cards laced with iodine-125, a substance used in medicine that has a half-life of 60 days. That means it stays radioactive for longer than most other types of radioactive iodine. It's not clear what type of game the cards were being used for. The venue was not authorised for gambling. The German authorities ordered the area to be sealed and cleaned, and say that there is no wider risk of contamination. In 2013, workers at a casino in France marked some cards with invisible ink, which Italian gambler Stefano Ampollini could see through infra-red contact lenses. He and two others were jailed and fined. In 2004, a group of gamblers used a laser scanner to measure the speed of the ball on a roulette wheel and gauge which numbers were likely to come up. 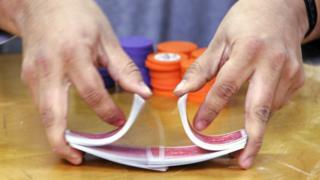 The trio won more than £1m ($1.8m) at the Ritz Casino in London and police told them they could keep their winnings. In 1999, a South African casino discovered a scam whereby the country's only playing cards manufacturer had been subtly marking its cards to help gamblers in the know cheat their way to a fortune. Officials at Caesar's Casino in Johannesburg noticed their blackjack takings drop by 11% in three weeks and uncovered the cheat. They think information about the marked cards was sold to gamblers either for a flat fee or for commission on their winnings.